Do the isometric drawings for the Bomber's pylon construction leave you with a headache? In report #27, Tandy Walker gives some step-by-step hints. 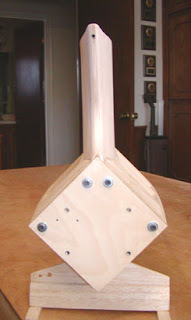 Today, I completed planking the Bomber's attached pylon structure, except for some final finish sanding. To repeat myself, planking this structure is undoubtedly one of most difficult task I have ever done. 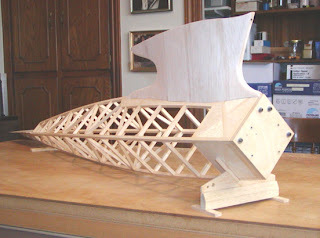 I want to walk you through the Bomber's pylon planking process in the following pictures. As you recall from my Report No. 25, this is what the unplanked pylon structure looked like. 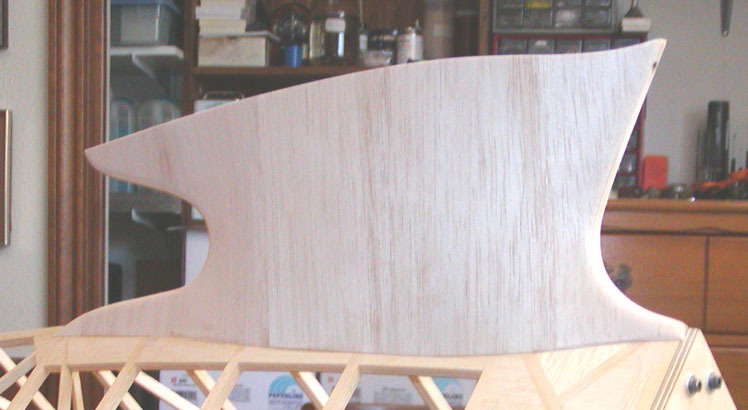 To jump to the end for a moment, here is what it looks like planked. Notice the complex intersection of the bottom edge of the planking with the fuselage as you move from the LE aft back to the TE. On my previous big Bomber, I made the mistake of using medium soft balsa for ease in planking the pylon. At the contest flight line, when I hit the big Edco Sky Devil .65 with the electric starter, my crewman (Joe Percy) punched his thumb through the soft rear pylon planking while trying to hold the Bomber in place. Since I am going to power this Bomber with a hot Series 20 McCoy .60, this time I selected medium hard balsa for the pylon planking, which makes the planking even more difficult. 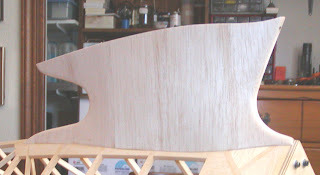 In the picture below, you can see the "hour glass" effect of the forward planking. 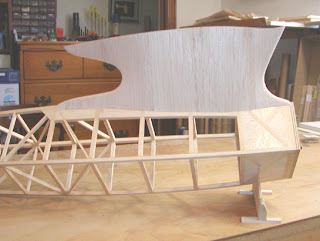 The problem arises when trying to shape the bottom edge of the planking to make it fit properly where it intersects the fuselage's sheeting. 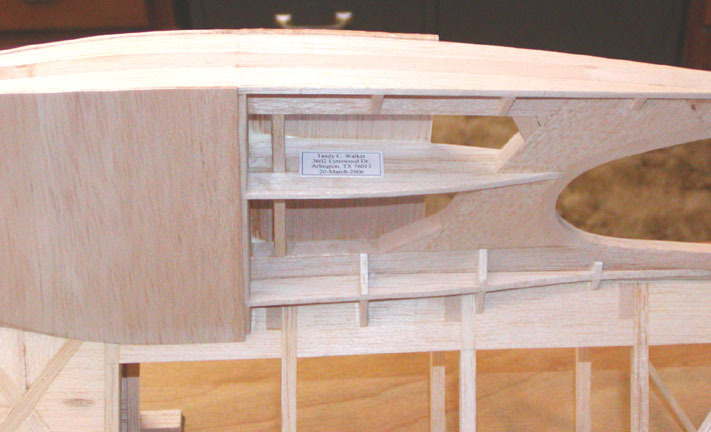 To achieve "Fit Properly" requires several iterations, trial fittings, and loads of patience for each sheet. 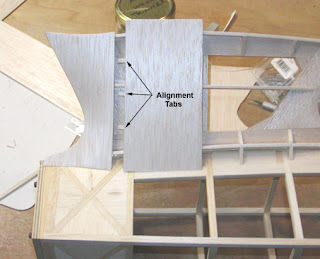 This picture also shows the internal alignment tabs on the aft sheet required to properly interface the planking vertical joint. This picture shows the above planking joint completed. 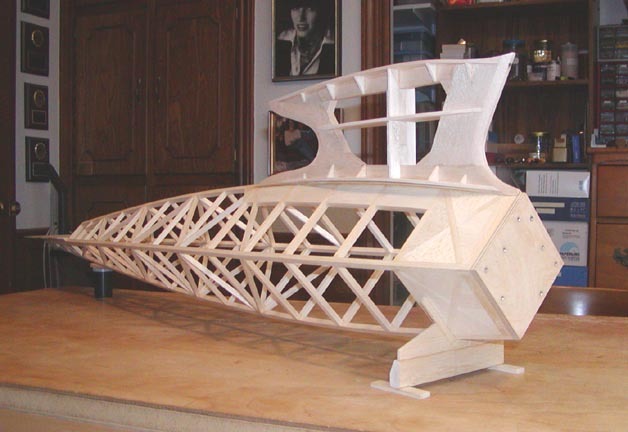 Note that the pylon cross section goes from a varying width hour glass at the LE to a constant width along the pylon vertical brace. 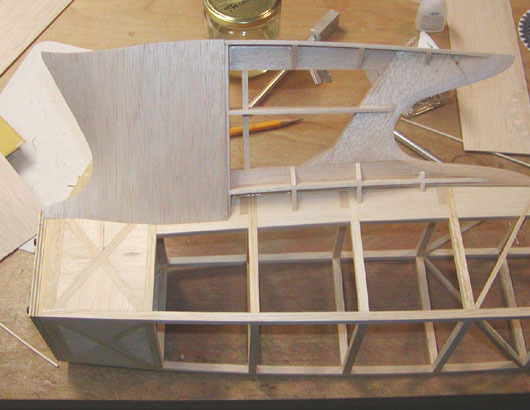 Also notice the complex intersection starting to form of the bottom edge of the planking with the fuselage as you move from the LE aft. This shows a close up of that intersection. 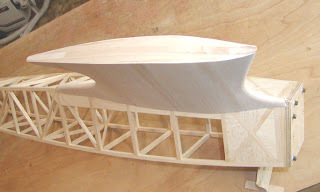 quite large, this built up structure is surprisingly light weight. 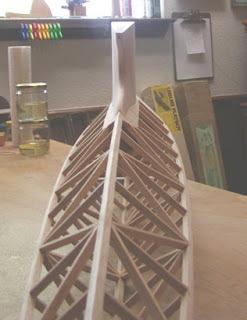 The 1/16" planking really adds the final stiffness to the pylon and securely attaches it to the fuselage. Don't ever let anyone try and tell you that a Bomber is easy to build! Those of you who have built one know what I mean. 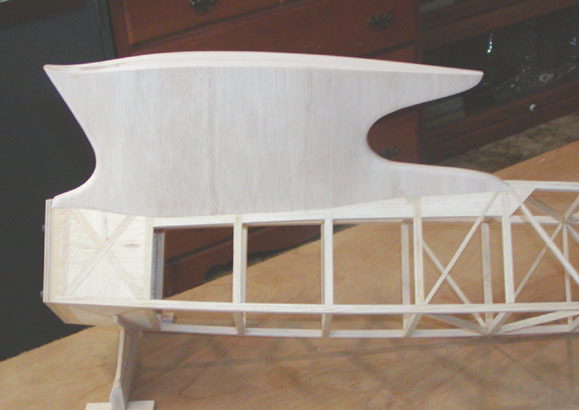 This completes all of the Bomber's basic structure now except for the wing. However, I think my next step will be to install the ignition system, radio equipment, servos, and control linkages. Larry Davidson's improvement on the Lanzo plan includes dropping the core of the pylon down into the fuselage. The top corners are reinforced with large gussets and the pylon core replaces the top longeron which is cut away.